We are The Pulling Linemen: dedicated to bringing you stories and opinions from the guys at the centre of football - Linemen! The modern NFL is an extremely quarterback friendly environment. 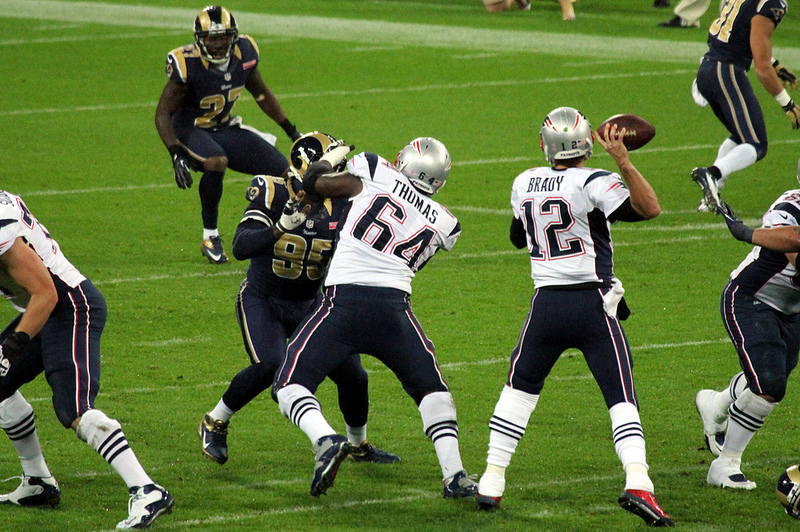 Defenders can't hit you below the knee in the pocket. A slight graze of your helmet is a 15 yard penalty and safeties can no longer blast receivers over the middle. But sunday 20th October was dark day for signal callers around the league. Two serious injuries have teams reeling while other minor ones have created openings for backups to stake their claim to starting jobs. We got to see two rookies take to the field this week thanks to injuries and have varying levels of success while two wildly successful veterans had very disappointing days. But let's begin with the clearest of all these murky QB situations. 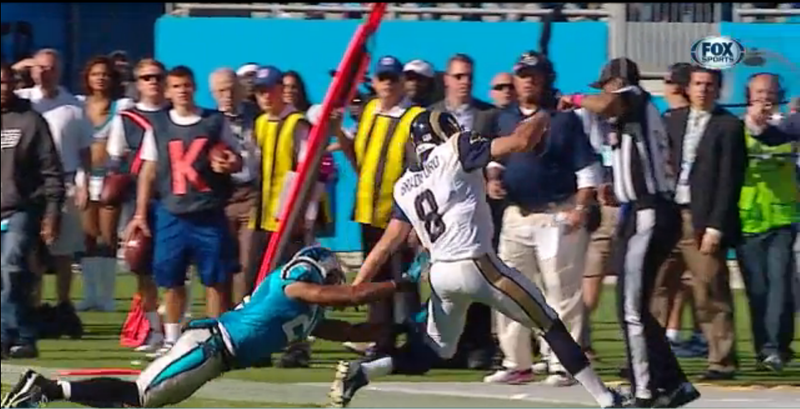 Sam Bradford of the St. Louis Rams is out for the year with a torn ACL in his left knee. The injury happened on an innocuous play late in the 4th quarter after a scramble when he was given a perfectly legal helping push out of bounds by safety Mike Mitchell. Bradford was clearly in pain on the sideline immediately after his awkward fall, Mitchell's celebration irked guard Harvey Dahl straight away, and then down right pissed him off after he saw his QB was hurt. Dahl came back for more with Mitchell after the next play too (By the way I've never seen anyone throw their arms up and stand there looking for adulation for so long after a soft shove out of bounds. I think Dahl thought he was celebrating the injury more than the "tackle"). 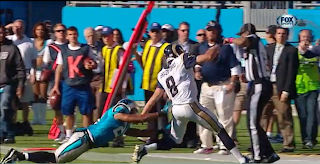 But the ensuing scuffle aside, this is a huge blow for the Rams. No, they weren't going to challenge for a playoff berth this year but Bradford was showing just why the Rams picked him 1st overall. 14 touchdowns to just 4 interceptions this year along with a 60.7% completion rate is very good, especially when you consider the Rams receivers have had 20 dropped passes this year. Bradford is in the 4th year of his monster $78 million, 6 year rookie contract and we've seen that ACL injuries can take longer for quarterbacks to come back from than other positions due to the traffic that they need to step into and the faith they have their their plant leg will hold. Carson Palmer was sidetracked for a long time by his torn ACL, it took Tom Brady nearly 2 years to recover and then return to his previous All-Pro level of play and we're seeing this year that Robert Griffin III is still affected by it. The Rams got a lot from the mega-trade the made with Washington last year, but it was all done on the assumption that Bradford would prove himself to be "the guy". It looked like he was on the way to doing that this year but now his future, and that of the franchise, is up in the air. Backup Kellen Clemens has been with the Rams for over 2 years now, and with their minimal cap room it's unlikely that they're able to bring anyone else in to compete with him. The 8 year veteran has 382 career pass attempts between his time with the Jets and Rams so he's no novice, but he's not going to help the Rams bridge the gap to San Fran and Seattle any time soon. 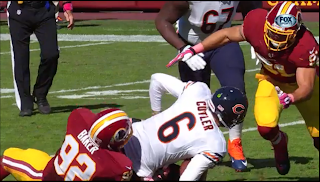 From Carolina up the coast to Washington when Chicago Bears quarterback Jay Cutler suffered a groin injury early in the second quarter that the Bears fear may keep him out for the rest of the season. MRI results are expected back today but they've already called Jordan Palmer, who was with them during pre-season, into Halas Hall which is a worrying sign. Even more worrying for the Bears is the fact that their traditionally strong defense has crumbled into dust this year after a spate of injuries have depleted the depth and ruined the effectiveness of their front 7. The Bears were 4-2 going into yesterday's game thanks mostly to an offense that new head coach Marc Trestman had moulded into an impressive unit. Some will point to the fact that Chicago scored 41 points last night as proof that they can compete without Jay Cutler, and it's true that his replacement Josh McCown did a decent job (14/20, 204 yards and a touchdown) but 17 points were provided by a Cutler-led offense and a Devin Hester punt return while McCown's ok numbers were put up against one of the very worst defenses in the league. Chicago do at least have their bye week coming up so they can take some time to formulate the next step be it with McCown or Palmer, or perhaps even with Cutler, but it's going to be a very difficult road to the playoffs from here. 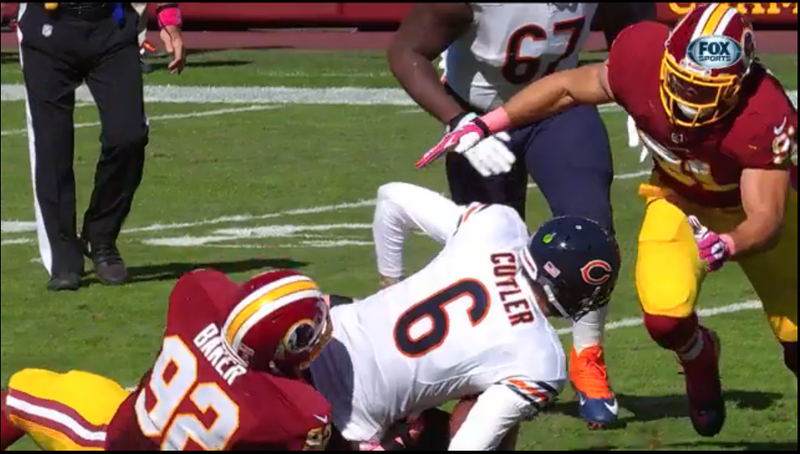 For Cutler this couldn't have come at a worse time. He is in the final year of his contract with Chicago and is far from a dead cert to be offered big money contracts from multiple teams. Cutler had missed 8 games in his previous 4 years with the Bears before this injury(all of them unfortunate and unlikely to repeat but it's still worth noting) and this draft class is, apparently, full of quarterback talent that teams might rather roll the dice on than an inconsistent if occasionally brilliant 31 years old. First let's look at the mess in Philadelphia. Nick Foles was utterly horrible against Dallas, completing just 11 of his 29 passes for 80 yards before getting knocked out of the game with a head injury. With Michael Vick inactive due to a hamstring injury rookie Matt Barkley stepped in and instantly proved that he was entirely out of his depth in the NFL this early in his pro career. He threw 3 picks in his 20 pass attempts and likely to be the last resort for the Eagles next week against the New York Giants but it's unclear if Vick or Foles will be available. At 3-4 my tip for the NFC East crown is looking shaky, but I still believe in Chip & Co. They have several winnable games left on the slate, if they can keep any QB healthy this year that is. Houston go into their bye week having lost 5 games in a row and will need to beat Indianapolis in week 9 if they're to have any shot at retaining their divisional crown, but it's likely that Matt Schaub will be fit for that game. Do they return him to the starting lineup or see what they've got in Keenum? More QB controversy could unfold this evening as Josh Freeman makes his first start for the Vikings less than two weeks after signing for them. His numbers this year are a truly horrific 45.7% completions, just 6.1 yards per attempt, 2 TD's and 3 INT's. But then his competition from Christian Ponder and Matt Cassel isn't much, so maybe he can lay claim to the job of "hand it off to Adrian Peterson and don't turn the ball over" that is seemingly vacant in Minnesota. Tom Brady and Peyton Manning had a rough time of it throwing deep this week. Brady was just 4 for 20 on passes travelling more than 10 yards down field, and Peyton was continually unable to take advantage of single coverage on his receivers down the field. Both guys are getting on now, if they've lost this part of their game it will be very tricky, if not impossible, to get it back. Thad Lewis continues to look effective in relief of EJ Manuel. I don't think Buffalo will keep him starting when Manuel returns to fitness, but this brief cameo might just convince someone else to take a shot with Thad. No Julio Jones or Roddy White didn't seem to hamper Matt Ryan one bit. He was 100% throwing to Harry Douglas who finished the day with 7 catches for 149 yards and a TD. Ryan himself was an impressive 20/26 for 273 yards and 3 TD's against Tampa. And finally, Andrew Luck is pretty damn good at football. Indy and Pep Hamilton need to put this "power run identity" dream to one side and let Luck carry them forward. Favourite Team: New England Patriots. Played For: Nottingham Outlaws ('07-'10, TE & LT). About Me: Have been watching football avidly since '06, writing since '11 just for the love of the game. About me: Former Nottingham Outlaws President and Coach. I play, I watch and I blog. There is no greater sport. Favourite Team: Tampa Bay Buccaneers. Played For: Nottingham Outlaws, OT (2 seasons, 2009/10-2010/11).